There is a moment during the climax of Boulevard when Kathy Baker (Joy) openly expresses her desire for a lifestyle that so many live and fight to maintain. The fight is a subtle one, but the feelings involved are anything but, even if they are not outwardly expressed on a regular basis. Everything is below the surface in the marriage between Nolan Mack (Academy Award® Winner Robin Williams) and Joy. Both are suppressing desire, but only one grows to want to take steps to have more. They respect each other and have a neat, clean home and have neat meals. But it’s not real. Usually I remind myself that there are so many people around me living that way, but I was so enthralled with the Mack household that I was only thinking about when something would blow up in it. The silence is deafening. 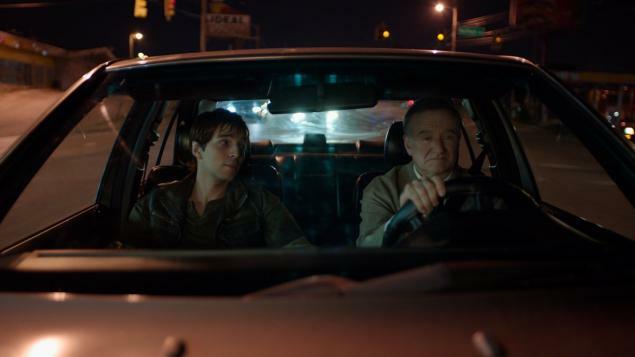 Directed by Dito Montiel and written by Douglas Soesbe, Boulevard is the last released onscreen Robin Williams performance (and his final dramatic role). I had the privilege of seeing this film as a screening of the New York Film Critics Series. To me, the quietness of the film reflects the below-the-surface life of Williams’s and Baker’s characters. Nolan steps outside of his world to find fulfillment because either he lives a more authentic life or he dies. Some people are made to live in fantasy, and some are not. Others can for a while or for years, but then have to get out. Some go in and out for their entire lives. Eventually Nolan makes his decision, but let’s just say he makes a big one. Roberto Aguire is vulnerable and magnetic as Leo, to whom Nolan is drawn for the companionship he needs. When Leo resists this would-be emotional connection, as a viewer you are wondering what will happen and what will be Nolan’s reaction. These quiet performances have explosions, but those explosions are muted because of the people who have them and because that is what most explosions are: real people in real situations. Besides, I want to take back the word explosions from those action/adventure movies that are all actual explosions and fires with no actual story. Robin Williams is truly a rare treasure. His talent transcends all labels, categories, and boundaries. His tortured Nolan makes you feel along with him, wonder along with him, and desire along with him. I couldn’t breathe because I knew Nolan couldn’t breathe in his life. It is a wonderful performance. Kathy Baker forces you to empathize with Joy because of her sincereness even if she is living a silent lie. Baker brings out her explosions (that are coupled with indignation) to perfection. You should see this film to see a communication of the truth that goes on behind closed doors and, through various means, can come spilling out.